The Post Primary Teachers' Association (PPTA), representing secondary teachers, also looks set to postpone their strike which had been planned for the same date. "We are committed to taking strike action on April 3," the email said. "Next week we will send you more detail about the results and responses from the survey but we wanted you to know the outcome as soon as possible." "Preceding the 15th there was a course that we were on," he said. "At the moment, given that a large proportion of our members and schools really need to focus on ensuring that stability for the children and their community and for themselves, because everyone has been touched by it, we are not proceeding on that course." 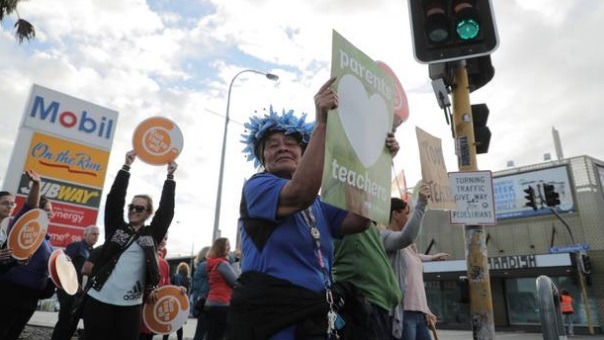 NZEI said next week's nationwide paid union meetings for area school teachers have also been cancelled. "Area school teacher members will now hold joint site meetings after school with their PPTA colleagues to discuss and vote on endorsing their claim for upcoming collective agreement negotiations," the union said.